A secondary dust explosion is where material outside of the process vessel is disturbed by the explosion to form an external dust cloud which is ignited by the flame of the primary. The first video sequence, shot at 600 frames per second, shows 0.5 grams of custard powder held in a boat on top of the vessel vent. The second video sequence shows the same experiment but this time with 1 gram of custard powder on top of the vent. Secondary dust explosions in the workplace can be catastrophic. There have been hundreds of incidents throughout the world where secondary explosions involving large quantities of dust have caused serious injury and death. 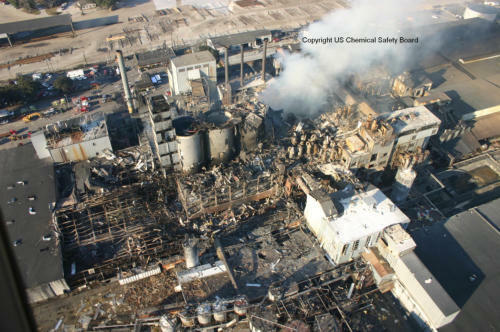 The picture below shows the effects of a devastating sugar dust explosion which killed 14 workers and injured 36 (photo courtesy of the US Chemical Safety Board). Secondary explosions may be avoided by good housekeeping and appropriate process control – stopping dust from leaking, implementing good cleaning regimes and keeping the factory clear of dust. A secondary dust explosion is where material outside of the process vessel is disturbed by the explosion to form an external dust cloud which is ignited by the flame of the primary. The first video sequence, shot at 600 frames per second, shows 0.5 grams of custard powder held in a boat on top of the vessel vent. The second video sequence shows the same experiment but this time with 1 gram of custard powder on top of the vent. Secondary dust explosions in the workplace can be catastrophic. There have been hundreds of incidents throughout the world where secondary explosions involving large quantities of dust have caused serious injury and death. In February 2008, a devastating sugar dust explosion occurred which killed 14 workers and injured 36 at the Imperial Sugar factory, Port Wentworth, Georgia, USA. Secondary explosions may be avoided by good housekeeping and appropriate process control – stopping dust from leaking, implementing good cleaning regimes and keeping the factory clear of dust.